Perhaps In My Lifetime | Academic Women for Equality Now! Academic Women for Equality Now! Finally we have some results from the latest AAMC report on the state of women in academic medicine. 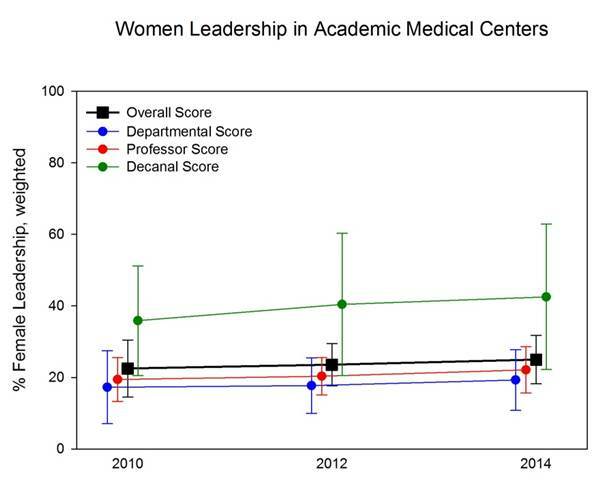 Report cards for each college of medicine will take a bit more time, but the overall results for women in leadership positions are shown in the graph. Can you see the progress? The overall score, the black squares, has barely budged, but it has risen over the four years of analysis. Unfortunately, at this rate, we will require 40 more years to achieve a 50% share for women in medical college leadership! I will be 94, so I could live to see it. Or perhaps we can do something to accelerate the process. college, © 2019 Academic Women for Equality Now!